Prominent participants in the global fluorochemicals market are mainly concentrated in Europe and North America. In order to grow their market shares further, these players are the lucrative emerging economies’ market in Asia Pacific, the Middle East and Africa, and Latin America. Further, savvy manufacturers in the market are also seen focusing on improving their product offerings to meet the needs of both commercial and domestic segments. Rising affluence of people worldwide and the considerable building construction activities is serving to up demand in the global fluorochemicals market. This is because they are helping to generate demand for refrigerants, which are mostly required in the HVAC (heating, ventilation, and air-conditioning) industry and the food and beverages industry. Fluorochemical products like hydrofluorocarbon (HFC) and hydrochlorofluorocarbon (HCFC) play an important role in the production of refrigerants. A report by Transparency Market Research predicts the global fluorochemicals market to rise at steady CAGR of 5.3% from 2017 to 2025. At this pace, it expects the market to attain a value of US$26.71 bn by 2025 from US$16.88 bn in 2016. Products purveyed in the global fluorochemicals market are fluorocarbons, fluoropolymers, fluoroelastomers, aluminium fluoride (AIF3), etc. Of them, the fluorocarbons, which are formed when fluorine is covalently bonded to carbon atoms in different number and configurations, account for maximum share in the market. The strength and stability of these covalent bonds impart unique properties to fluorocarbons that allows them to function as refrigerants, solvents, lubricants, propellants, and stain-repellent products. In the years ahead too, the fluorocarbons are expected to see swift uptake on account of its use across applications like blowing agents, packaging, solvents, refrigerants, and aerosol propellants. The fluorocarbons can be further segmented into hydrofluorocarbon (HFC), hydrochlorofluorocarbon (HCFC), etc. Of them, the HFCs hold the maximum share. Depending upon application again, the global fluorochemicals market can be divided into refrigerants, plastic foams, aluminium production, electricals and electronics, etc. Of them, the segment of refrigerants led with most of the share in the market in 2016. It was trailed by aluminium production. Geographically, the key segments of the global fluorochemicals market are North America, Latin America, Europe, Asia Pacific, and the Middle East and Africa. A cluster of developing economies driving up demand for fluorochemicals for use in different applications and industries has propelled the market in Asia Pacific to the fore. The region will likely outshine others in terms of growth by registering a CAGR of 6.4% in the forecast period, at the end of which its revenue is expected to grow to US$15.21 bn. North America and Europe are considered mature markets for fluorochemicals, which are projected to grow at a tepid CAGR of 3.8% each during the period between 2017 and 2025. Regulations across different industries and applications such as aluminium production, food and beverages, plastic foams, refrigerants, etc. have resulted in the growth in the market in the two regions so far. Latin America and the Middle East and Africa, on the other hand, account for a relatively smaller share in the global fluorochemicals market on account of the political instability in the regions hampering healthy economic growth. Some of the key players in the fluorochemicals market are DuPont Inc, Daikin, Solvay SA, Asahi Glass, Arkema, Honeywell, Dongyue, Pelchem, Mitsui Chemicals Inc., and Air Products and Chemicals Inc. This report analyzes and forecasts the market for fluorochemicals at the global and regional level. The market has been forecast based on revenue (US$ Mn) from 2017 to 2025. The study includes drivers and restraints of the global fluorochemicals market. It also covers the impact of these drivers and restraints on demand for fluorochemicals during the forecast period. The report also highlights opportunities in the fluorochemicals market at the global and regional level. The report comprises a detailed value chain analysis, which provides a comprehensive view of the global fluorochemicals market. Porter’s Five Forces model for the fluorochemicals market has also been included to help understand the competitive landscape in the market. The study encompasses market attractiveness analysis, wherein end-users are benchmarked based on their market size, growth rate, and general attractiveness. The study provides a decisive view of the global fluorochemicals market by segmenting it in terms of product type and application. These segments have been analyzed based on present and future trends. Regional segmentation includes the current and forecast demand for fluorochemicals in North America, Europe, Asia Pacific, Latin America, and the Middle East & Africa. The report also covers demand for individual product type and application segments within all the regions. The study includes profiles of major companies operating in the global fluorochemicals market. 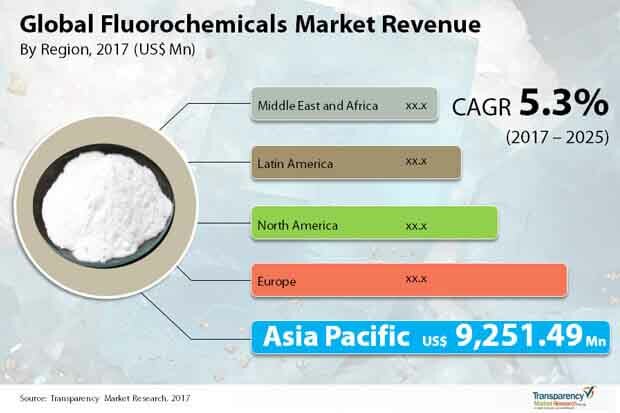 Key players in the fluorochemicals market include DuPont Inc, Daikin, Solvay SA, Asahi Glass, Arkema, Honeywell, Dongyue, Air Products and Chemicals Inc., Mitsui Chemicals Inc., and Pelchem, among others. Market players have been profiled in terms of attributes such as company overview, overall revenue, business strategies, recent developments, and SWOT analysis. The report provides the estimated market size of fluorochemicals for 2016 and forecast for the next eight years. The global market size of fluorochemicals has been provided in terms of revenue. Market numbers have been estimated based on product type and application segments of the fluorochemicals market. Market size and forecast for each major product type and application has been provided in terms of global and regional markets. Secondary research sources that are typically referred to include, but are not limited to company websites, annual reports, financial reports, broker reports, investor presentations, and SEC filings, internal and external proprietary databases, and relevant patent and regulatory databases, national government documents, statistical databases, and market reports, news articles, press releases, webcasts specific to companies operating in the market, American Chemical Society, International Council of Chemical Associations, The World Factbook, The UN Statistical Division, and the European Union. Primary research involves e-mail interactions, telephonic interviews, and face-to-face interviews for each product type and application, and sub-segment across geographies. We conduct primary interviews on an ongoing basis with industry participants and commentators in order to validate the data and analysis. Primary interviews provide firsthand information on market size, market trends, growth trends, competitive landscape, and outlook, etc. These help validate and strengthen secondary research findings. These also help develop the analysis team’s expertise and market understanding.